Mild temperatures helped pack the house at Thompson Speedway Motorsports Park as six contenders vied for the NASCAR Whelen Modified Tour title including Doug Coby, Justin Bonsignore, Timmy Solomito, Ryan Preece, Eric Goodale and Rowan Pennink. The NWMT Sunoco World Series 150 and Championship title came down to a green white checker, overtime finish, the event extended to 155 laps with Timmy Solomito of Islip, NY making a winning pass on the final restart to capture the NWMT Sunoco World Series 150 victory. A fifth- place finish for Doug Coby was enough for the Milford, CT driver to once again, etch his name on the coveted NWMT Championship trophy. 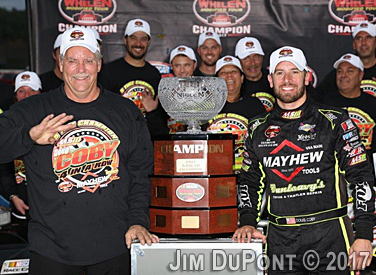 Coby is officially a five-time NWMT Champion, his fourth consecutive title with the Mike Smeriglio III team. 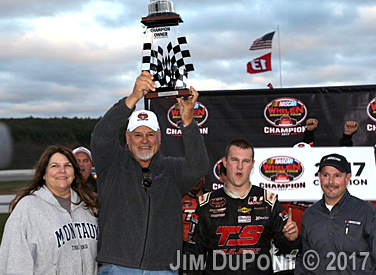 Ryan Preece of Berlin, CT brought the 6 car across the line for the NWMT Championship Car Owner title for Ed and Connie Partridge. "I can't believe it, no quit, not with these guys behind me," said Doug Coby at the trophy presentation. "You guys saw us here on the backstretch fence at the Icebreaker, we came out the rest of the season and dug deep, got some good finishes and did what we had to do to take care of business. I'm so happy for my crew, everybody at MS III Racing, especially Phil Moran who works on this car day in and day out, all the guys in the shop, Mayhew Tools who came on board this year, we finally got them a championship. What a tight, tight season it was, we all mixed it up pretty good, these guys are fun to race with and really, amazing to come out on top, four in a row." 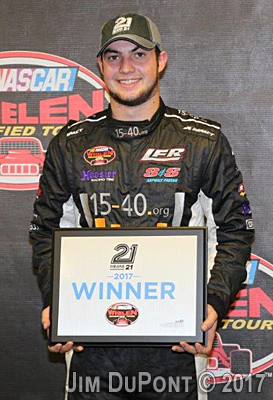 The NWMT Sunoco World Series 150 was led to green by pole winner Chase Dowling with Coby on the outside of the front row. While the action was halted for a red flag on the start for half a dozen cars tangled and scattered in turn one, the action resumed shortly with Coby taking the lead on the restart. Solomito in the Eric Sanderson, Starrett Racing sponsored machine qualified eighth in a backup car after an incident in practice the previous day and hovered just out of the top ten the first fifty circuits. Meanwhile, Coby was in command out front keeping his distance from Ryan Preece, Rob Summers, Craig Lutz and Ron Silk the top five at lap fifty. Without warning, Preece in the TS Hauler sponsored modified was off the pace, stopping in turn one with possible electrical issues, bringing out the fourth caution of the day on lap 61. Solomito, Eric Goodale, Rowan Pennink, Chase Dowling and Ron Silk were among the sixteen cars that pitted under yellow. Coby stayed out along with Summers, Justin Bonsignore, Jimmy Blewett and David Sapienza the top five for the lap 66 restart. Just past the half way mark, Coby still in command, clenched the most laps led needing to finish now, seventh or better for the title. Solomito had cracked the top ten while Justin Bonsignore was still in it running fifth. Caution on lap 80 brought the leaders down pit road including Coby and Bonsignore. Craig Lutz inherited the lead and on the lap 85 restart was side by side with Woody Pitkat, Ron Silk third and Solomito fourth. Solomito quickly took over third while Coby was in the pack running eleventh. Lap 87, contact between Eric Goodale and Matt Swanson sent Goodale across the front stretch grass missing Coby’s bumper by a whisker. Up front, Lutz was challenged by Pitkat and Silk with Solomito now up to fifth, Coby eighth by lap 100. Ryan Preece was back on the track just before the century mark, several laps down after repairing the electrical issue and while not a factor for the win, he had clenched the championship car owner title for Ed Partridge. The yellow on lap 104, Coby and Solomito were among a dozen drivers who came down pit road setting up a restart on lap 111 with Ron Silk, Andrew Krause, Matt Swanson, Justin Bonsignore and Rob Summers the top five leading the way. Silk and Bonsignore broke from the pack only to be gathered back in by a yellow on lap 125. Two more cautions kept the field tight with Silk, Bonsignore, Solomito now in third, Pitkat and Coby the top five on the lap 141 restart. Three title contenders, Bonsignore, Solomito and Coby in the top five with nine to go, a three-wide battle down the back stretch gone wrong unfolded right in front of Coby. Pitkat had lost his lane, Bonsignore was forced to pit with a left front flat. Silk remained the leader with Solomito second and Coby up to third. It was the final restart on lap 153 that Solomito made his move passing Silk for the lead taking Chase Dowling with him. Coby kept to the low lane and with the checkered flag in the air, Solomito brought the Flamingo Motorsports 16 across the stripe for his fifth win of 2017. Dowling, Silk, Pennink followed with Coby finishing fifth - enough to clinch the championship title. Andrew Krause, Woody Pitkat, Dave Sapienza, Jamie Tomaino and Justin Bonsignore completed the top ten. Solomito pulled into victory lane while Coby and Preece were held in turn three by NASCAR Officials for their presentations. "Yesterday we had to roll out the back-up car out of the trailer,” explained Solomito. “Just goes to show you how great these guys are. We qualified eighth with no laps on the car and put it in victory Lane today. There was a lot of determination after what happened in practice yesterday. We ran really well this year and will be even stronger next year. It is probably the break of my life being able to drive for this Flamingo team, everyone that's involved, I'm just real lucky to be part of such a great team." "I knew we had a good car,” continued Solomito. “We had that restart before that and I knew that we had to get a really good restart to be alongside him (Silk) going into turn one, we were able to get that restart, obviously we were able to make a pass and go home with the win. We didn't win the championship we won the race. We did everything we could today. From unloading the car yesterday, having zero practice laps on it, I think it's pretty impressive. It just goes to show you how good Flamingo Motorsports, Starrett Tools team really is. Will come back next year and fight for the championship again." Solomito finished the season six points short of the title. "We had a strong year,” said Solomito. “Five wins is nothing to shake our head at, 3 poles and a lot of laps led. I am proud of the entire team and just lucky to part of such a great team." Ron Silk posted a podium finish for the Stuart’s Automotive, J&R Pre-Cast sponsored ride owned by Robert Katon. "We were good the beginning part of the race but we were just way too loose. The first real yellow there on lap 61, I was running fourth but I just couldn't go forward from there, I was hanging on loose. We came in, made some adjustments and took our tires then. The guys did a great job on pit road, we almost nailed the adjustment we just ended up being too tight but it was still working pretty well. I think all those restarts at the end combined with being on a little bit older tires, we did a good job hanging on for what we did." Doug Coby will need to change his driver suit to read 5X Champion. 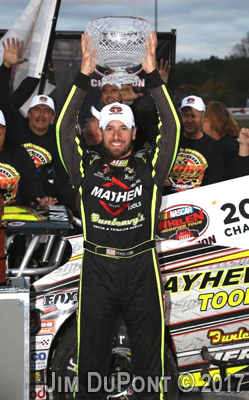 Coby avoided two close calls in the Sunoco World Series 150 to bring the 2 car home becoming a five-time NWMT Champion, making history with four consecutive titles. With the help of sponsors Mayhew Tools, Dunleavy Truck & Trailer Repair, A.J. Romano Construction, Coby will be the first to tell you, it isn’t easy. "This Tour is very different now,” explained Coby. “It's crazy that I am one of the veterans on the Tour. I look at the NASCAR race stats when they come out on Wednesdays before the race and it shows career starts at Thompson and it has Wade Cole, Jamie Tomaino, Doug Coby. I'm like I'm old now, that's weird. I used to love it when it was a number of top fives, top tens, number of wins or poles and your number would sneak into the bottom of that behind Tony Hirschman or behind Ted Christopher and now I'm like if you look at the 35 cars out there today, I've been around the track more than 90% of these guys which is nuts. To me, I still feel like a young kid every time this championship stuff happens, I still feel like I'm trying to get in a full-time ride. That is always going to be locked into my brain, the 2009 and 2010 driver who was trying to prove myself. I think I'll feel that way for the rest of my career." "Finally, I got hooked up with the right people, the right team, the right equipment and obviously it led to this. We're on that roll and until somebody knocks us off the perch we're going to stay there." Phil Moran is now a five-time NWMT Championship crew chief. His first coming in 2003 with driver Todd Szegedy and car owner Don Barker. The last four with Coby and car owner Mike Smeriglio. "It was a tough year, we had a lot of ups and a lot of downs,” admitted Moran. “It's all about consistency and having a really good car. We had it, circumstances didn't let us finish where we wanted to. Doug is such a smart driver, he knows what he needs to do. Today we had a winning car but we had to look at the big picture after half away. The goal was to lead a lap, lead the most laps and of course win the race to take the max points but we got to the halfway point, the car was good then we decided to play it safe, do our pitstop, get our tires on and see what we had." MS III Racing opted to run the non- points race in Charlotte the week prior. Heading south with a limited crew, Moran realizes looking back, the tight schedule may have kept him from over thinking World Series weekend. "The way the points battle was, actually going to Charlotte took my mind off of it,” said Moran. “Then winning at Charlotte, winning with a short crew at Charlotte, it builds momentum. Even if everyone wasn't there it got them all including Doug and myself, back on a high. I had a busy week which kept my mind off of stuff. It was good." On the brink of making history again, the quiet moments prior to the start of the action helped pull the pieces together for Moran. "Driving up here Friday morning for the parade, I was by myself, that's where I cleared my head, getting ready for the weekend. Friday night, I ran through the scenarios, it was time to put the game on." "I felt more pressure this year I think then years past,” said Moran. “Even when we came into this tied one year and the third-place car was three points back. I think it was because of the fact a lot of people expected us to get it and the way the year was going it wasn't going to happen. We got our stuff together and started running better and better. I believed that we were back in it the last time we raced here at Thompson when we crashed on the last lap and got second. We busted our butts and put that same car together to go to Bristol, the shortest turn around we had all season long. While other teams were fluffing and buffing their car we were putting a front clip on and changing a motor. We went to Bristol and finished a competitive second. Coming out of there then going to Riverhead and finishing second, that's what gets you on a roll." For car owner Mike Smeriglio III, this is what they have worked for all year. "I have four words for you, Doug Coby and Phil Moran." Smeriglio stopped for a moment between the steady stream of congratulations from the garage area to continue. "I'm so happy to be a part of it. That is the key to this team, no egos. We have a fearless leader in Phil and Doug understands that." "I'm a fan first,” said Smeriglio. “I grew up sitting in the grandstands next to Randy LaJoie when our families were racing. I never got behind the wheel nor did I ever want to. My forte is to plan, to budget, to execute and deliver on the upper level with sponsors. With Mayhew on board and obviously the success we've had with Doug Dunleavy it's really second to none. I'm not knocking anybody but the Tour is finally getting recognized as a unified division- we're going north and south now- and it's great to showcase what we have. To put Mayhew front and center in Charlotte in victory lane, it doesn't get any better than that." Smeriglio is all smiles as he explains the ribbing he is getting from 5x Coby and Moran. "Coby has been very successful in the 2 car; championship after championship. But being the owner, he has one more than me coming into the series. I'm like Doug, we have to even this out. He is like, I don't know how to do that Mike. I said, well you got to figure it out and he said OK.” Smeriglio hesitates, throws out his hands and laughing says, “Now, he is two ahead of me. That's a joke between us." Moran reminded Smeriglio he is also 5x. The laughing started again as the hands went up. "All kudos to the 6 team, Eddie Partridge,” Smeriglio sincerely continued. “Congratulations to them, they had a stellar season. I hope the best for Ryan, he belongs up, he wants to go up. We want to stay, we will be back in 2018, hopefully a little stronger." For the first time since the inception of the series, the NWMT Car Owner Champion is different than the driver champion. Ed Partridge along with his wife Connie were presented the NWMT Owner’s Championship Sunday by NASCAR’s Jimmy Wilson. Ryan Preece tallied five NWMT wins in 2017 but missed two races. George Brunnhoelzl III and Jon McKennedy were the drivers that filled out the 2017 season. 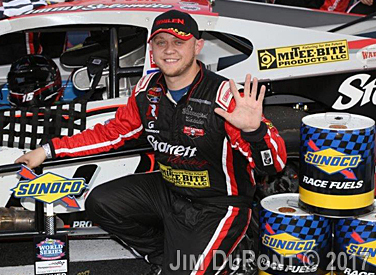 Preece basically needed to start the Sunoco World Series 150 to secure the title for Partridge. “We had a really solid year,” said Preece. “We won a lot of races, we were really consistent and when we were on the track we were really fast, that's all you can really hope for. I have to thank Ed and Connie for letting me drive this car, work on this race car. Back in December I didn't know what I was going to do and Eddie said he would give me a job and let him drive his race car. I have 100% support from Ed and Connie for that and in return I wanted to do as much as I could to help them win this owners championship." “At the beginning of the year,” Ed Partridge explained, “Ryan called me up - he wanted to come back home. He asked about getting a job, maintaining the cars, being crew chief, set up guy, paperwork, doing everything. We agreed, he came home and we had a phenomenal year. For him being a crew chief, driver, set up guy, I was very impressed to say the least. I thought at the beginning of the year we would be in trouble with that, because everyone has a crew chief. We were kind of old schooling it like Richie Evans style. I'm just completely amazed at the job he did." It is not possible to mention Ed Partridge without his wife Connie when it comes to racing. "Connie is very supportive of this. We own Riverhead Raceway now, she is very busy there plus we have the trucking company, she's working and I'm working full boat. The team, all my guys are 100 percent good guys. They work hard, they've done a great job all season." Plans for 2018? There has been talk but nothing set in stone with one exception, the TS Hauler 6 car will be at New Smyrna in February. 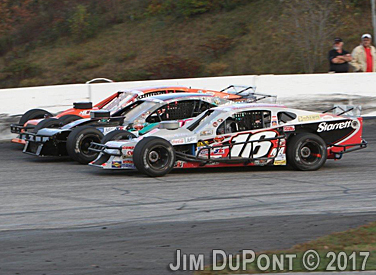 NBCSN will air the NWMT Sunoco World Series 150 on Thursday, Oct 19th at 6pm.